Robust and clinically convenient cancer biomarkers are of great importance for the successful delivery of precision medicine and better clinical care for cancer patients. Firstly, the latency for cancers is long, and cancer patients usually exhibit symptoms at advanced stages when curative treatment may no longer be available. Therefore, screening and early detection of cancers at asymptomatic and/or curable stages are especially critical in improving patients’ survival and quality of life [1–3], as well as reducing the burden of healthcare system. Secondly, the dynamics of tumorigenesis is the main hurdle to effective treatments in cancer patients  and remains a grand challenge for cancer precision medicine. Tumor heterogeneity and clonal evolution are the two major consequences of the dynamics of tumorigenesis, which can simultaneously drive tumor evolution , posing challenges in the selection of anticancer drugs as well as the optimal doses of these drugs. Thirdly, patients with metastatic cancers of unknown primary sites usually have poor prognosis and dismal survival rate because site-specific targeted therapies are not effective [6, 7]. To reduce cancer mortality and improve the overall quality of healthcare outcomes and well-being of the patients, there is an urgent need to develop minimally-invasive biomarkers that are sensitive and specific enough for clinical applications such as early cancer detection, longitudinal surveillance of dynamic tumor progression under drug treatment, and the selection of targeted therapies for cancers of unknown primary sites. In this review, we overview the current states of molecular biomarkers in cancer diagnosis and prognosis, as well as discuss the potential benefits and limitations of the new approaches for detecting a novel class of epigenetic biomarkers, 5-hydroxymethylcytosine (5hmC) biomarkers, in cell-free DNA (cfDNA). Furthermore, we provide an update and current perspectives for 5hmC alterations in patients with different cancer types and discuss their potential role as cancer biomarkers. Finally, we point out the improvements and future work required to make these biomarkers effective in the clinic. In addition, merely relying on the identification of tumor-derived driver mutations in ctDNA cannot capture the whole complexity of tumor biology . Unlike mutations, the reversible epigenetic modifications are more plastic and can reflect the changes of tumor microenvironment and tissue of origin [27, 28]. Epigenetic modifications such as DNA methylation may represent a novel and promising analytical tool for biomarker discovery with broad potential applications in risk assessment, early cancer detection, prognosis, and prediction of response to therapy [29–31]. To date, DNA methylation-based assay, Epi proColon, has been approved by the US Food and Drug Administration (USFDA) for colon cancer detection . In the early stages of carcinogenesis, many epigenetic changes have occurred in normal tissues before somatic mutations and histopathological changes can be detected . 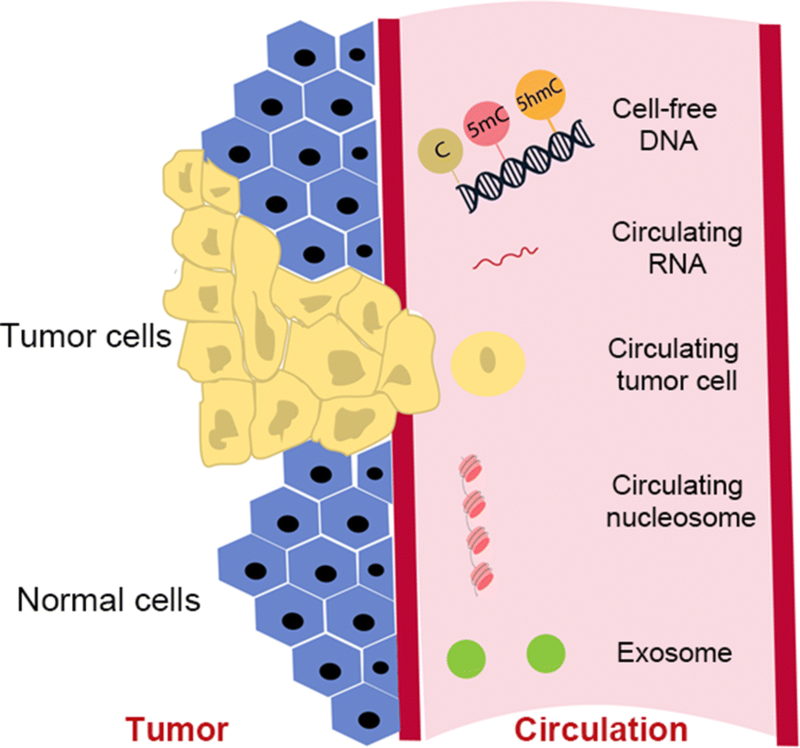 Therefore, epigenetic analysis of cfDNA combined with mutation-based analysis may contribute to a better understanding of the interplay across molecular alterations in the cancer genome, epigenome, and tumor microenvironment in tumor heterogeneity and clonal evolution [27, 28, 30, 34–36]. The most extensively studied epigenetic feature for cancer biomarker discovery in cfDNA is DNA methylation, especially the 5-methylcytosine (5mC) modification at CpG dinucleotides [29, 35, 38–41]. In hepatocellular carcinoma, 5mC biomarkers derived from ctDNA showed better diagnostic and prognostic values than currently used indicators (such as serum-based alpha-fetoprotein [AFP] and TNM staging) . In addition, repetitive elements such as long intersperse nucleotide element 1 (LINE-1) and Alu are known proxies for global DNA methylation . In diffuse large B cell lymphoma, LINE-1 methylation in cfDNA has been shown to be strongly associated with clinical outcomes, demonstrating its potential as a prognostic biomarker . Another approach in 5mC biomarker discovery is to identify tissue-specific methylation haplotypes as biomarkers to estimate tumor burden and tissue-of-origin in cfDNA . These multi-CpG haplotypes have been shown to outperform the traditional single-CpG methylation biomarker in cancer classification . Recently, other epigenetic features such as 5-hydroxymethylcytosine (5hmC) and nucleosome positioning and occupancy on cfDNA have also been utilized to infer tissue of origin and cancer progression [27, 44–47]. Although genome-wide nucleosome distribution of cfDNA provides valuable information in the deconvolution of pooled cfDNA to infer tissue of origin, its clinical application has not been extensively studied [27, 48]. In this review, we summarize the advances in the genome-wide profiling of 5hmC dynamics in cfDNA for cancer biomarker discovery based on the unique features and distinct biological functions of modified cytosines. In the human genome, 5mC is the most abundant and well-known DNA methylation variant that plays an important role in the regulation of gene expression . The 5mC-associated methylation patterns are usually tumor- and tissue-specific, reflecting the origin of the metastatic tumors and their altered epigenomes . With the mediation of ten-eleven translocation (Tet) proteins, 5mC can be further oxidized to 5hmC, 5-formylcytosine (5fC), and 5-carboxylcytosine (5caC) . Among them, 5hmC is the most abundant and stably oxidized product . In contrast to about 8% of cytosine that is methylated in the human genome, only 0.5%–1% of cytosines are hydroxymethylated. The scarcity of 5hmC in the genome may pose challenges in distinguishing true signals from noise upon sequencing. However, it also has the potential to improve the statistical power in biomarker discovery because of the reduced multiple hypothesis burden [39, 52–54]. Unlike the uniform distribution of 5mC outside of the promoter regions, satellites, and repeat DNA sequences , 5hmC has distinct distributions across different functional regions, and its abundance varies across different tissues and cell types [56, 57], with tissue type playing a dominant role in determining the distribution patterns of 5hmC . 5hmC is enriched primarily in the distal regulatory regions, gene bodies of actively expressing genes and promoters, indicating its connection with active transcription . Genome-wide analysis of 5mC has indicated the global hypomethylation pattern in tumor tissues, whereas depletion of 5hmC has also been associated with the hypermethylation of gene bodies in various cancers [58, 60, 61]. Significant enrichment of 5hmC is observed in both tissue-specific and cancer-specific differentially methylated regions as compared with that of 5mC . Thus, genome-wide analysis of 5hmC dynamics can further refine our understanding of the relationship between cancer and methylome. Because 5hmC and 5mC dynamics can be informative of tumorigenesis, epigenome-wide analysis of cfDNA has also been conducted to identify minimally-invasive cfDNA-derived biomarkers for better cancer management [35, 45, 46, 63–66]. An overview of the most common genome-wide 5hmC quantification methods are summarized in Table 1. Several recent studies have demonstrated that 5hmC signatures in cfDNA are reliable and sensitive epigenetic markers that are indicative of types and stages of cancers [44–46]. These cfDNA-derived 5hmC biomarkers are found to achieve higher detection sensitivity than classical biomarkers . GC is a common digestive cancer with 26,240 new cases and 10,800 deaths estimated in 2018 in the United States . Early-stage GC is asymptomatic and exhibits high genomic heterogeneity, making endoscopic or surgical biopsy-based molecular testing rather inaccurate and non-representative . Recent studies suggested the potential role of cfDNA-based molecular profiling in future clinical applications such as diagnosis and targeted therapy selection. However, the epigenetic alterations on cfDNA remain understudied [81–83]. A pilot study has explored the 5hmC alterations in cfDNA from GC patients as compared to that from healthy individuals in a Chinese cohort . Patients with GC and controls were divided into discovery (7 patients and 18 controls) and validation groups (25 patients and 35 controls) . In total, 1431 differentially methylated 5hmC loci in gene bodies were identified and trained on the cancer classifier, and the classifier achieved 92% sensitivity and 91% specificity (AUC = 0.93) in the validating dataset and 90% sensitivity and 97% specificity (AUC = 0.97) in another independent validating dataset . Again, consistent with the study in CRC, these cfDNA-derived 5hmC biomarkers performed better than classical early diagnosis biomarkers, such as carcinoembryonic antigen (CEA) and cancer antigen 19-9 (CA19-9), and other epidemiological factors, such as smoking and alcohol . In both CRC and GC, the classifiers derived from cfDNA are disease-, clinical stage-, and cancer type-specific, suggesting their potential values as diagnostic cancer biomarkers .